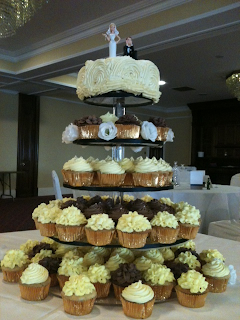 Wedding season is well under way for me, I definitely think cupcake wedding cakes as a genre is getting stronger in the world of weddings . Once the happy couple have taken the leap and chosen cupcakes the next decision is whether or not to have a cutting cake on top or purely have cupcakes. Over the next few blogs I will be showcasing some of this years wedding cakes and the ideas behind them. This first cake I'm going to talk about is this super cute cake, the flavours that were chosen are always a great crowd pleaser as there is something really for everybody. The winning flavours were double chocolate, zingy lemon and vanilla bean. For me I like the theme of the day to be captured in the cake completely, for instance the flowers that were used in the reception were ivory in color and lucky for us the florist had kept a few small flowers aside for us so I was able to incorporate them in the display. I used gold metallic cases for all the cakes which gave a great platform for the colors of the frosting and really showed off the pipping styles. The cutting cake was a 7" chocolate layer cake with a chocolate buttercream filling, the outer design was a vintage rose design in an ivory color, we decided to keep it a neutral color so not to take from the colors of the cupcakes.